One of the projects at the top of my summer to do list was refinishing a kitchen table – my table in particular. It has seen a lot of wear through the years and is looking pretty shabby. Instead of replacing it, I figured that it would be worth a try to fix it up. However, I have not done a wood refinishing project in oh, say 20 years. Yikes. Leave it to me to take on a table and eight chairs as my re-entry point. I wanted to approach this project in an organized and calculated way because it is going to disrupt our lives – at least for a little while. Usually, when it comes to home projects, I skimp on the planning and jump right in – only to regret it later. Refinishing a kitchen table is a different animal. This is not just the kitchen table – it is our ONLY table. With five people living under this roof, it gets a lot of use. So, I have spent many days just staring at the table trying to figure out what to do with it. The table itself seems to be made of solid oak – although the top could be a veneer. I thought about painting the whole darn thing because it seemed like the easiest thing to do. There are a lot of ideas online about using chalk paint – which is supposed to be very forgiving, requires little prep, and is simple to use. But I had a couple problems with that philosophy. 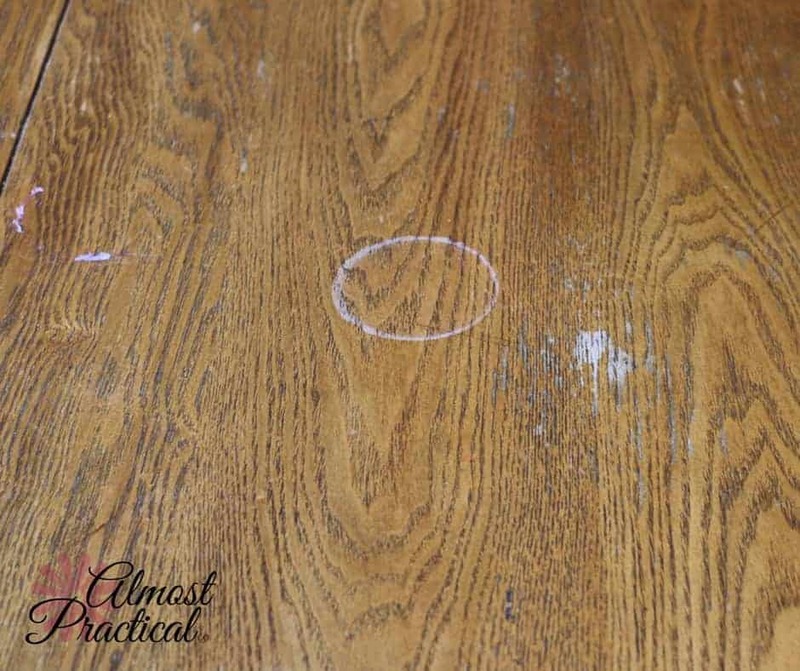 First, the table top is marred with cup marks and dirt – and no matter what you put on it, I don't think the surface will come out smooth without a little sanding. Second, I really like the look of the wood grain on the top. Third, with chalk paint it seems that you are supposed to wax the surface after painting. I want a really durable finish because our kitchen table takes a ton of abuse. Like I said, it is our only table. However, if you have ever stripped furniture before to prepare it for stain – you know that getting teeth pulled is probably a more pleasant experience. Stripping the varnish off of a table and eight chairs with all of their nooks and crannies is not happening. So, I decided to just strip and stain the table top and paint the legs and chairs – sort of like what you see here. The table right now is a golden oak color and I am kind of tired of that. In addition, I think the look is kind of dated. I would actually like to go lighten up the table top with a more weathered wood look because the room has a lot of beachy colors on the walls and in the decor. 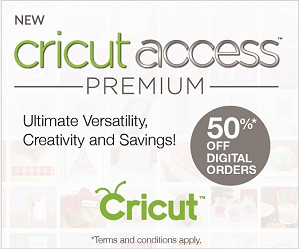 As for the table legs and chairs, I am really leaning toward something in an olive green or a creamy white. My first step will be refinishing the kitchen table top and then I will paint the legs. While I wait for coats to dry and that kind of stuff, I will probably get started on the chairs. I have not yet decided whether to stain the chair seats or paint them over. As you can see in these photos, the seats are pretty scratched and will require prep work regardless. So, I will make a list of what I need, head to Home Depot or Lowe's, and come back here and share that information with you. Hopefully, the total cost of stain, paint, and supplies will be less than buying a whole new kitchen table set. But since I don't have much on hand, I really am starting from scratch. 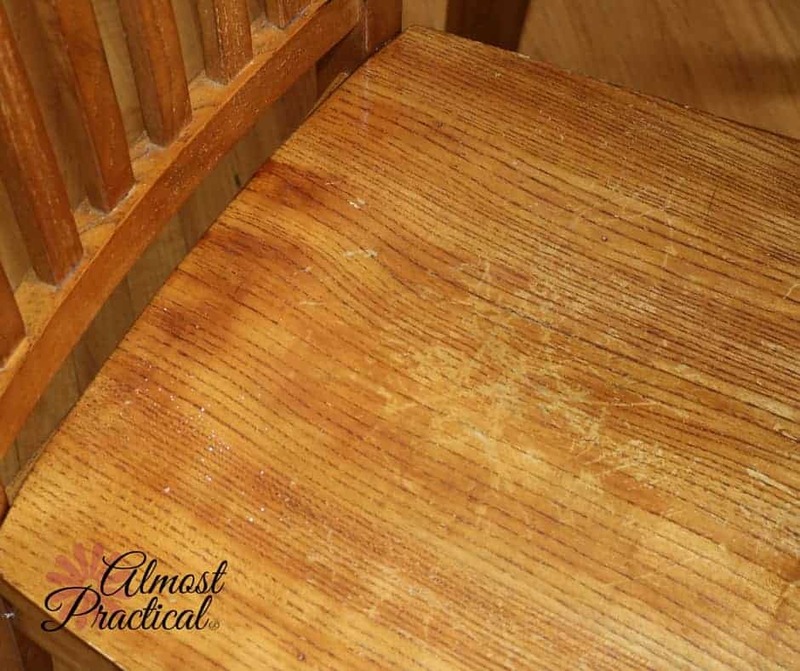 Step 3 – Applying a furniture refinisher – a few tips I picked up along the way. Part 4: Staining the kitchen table top. 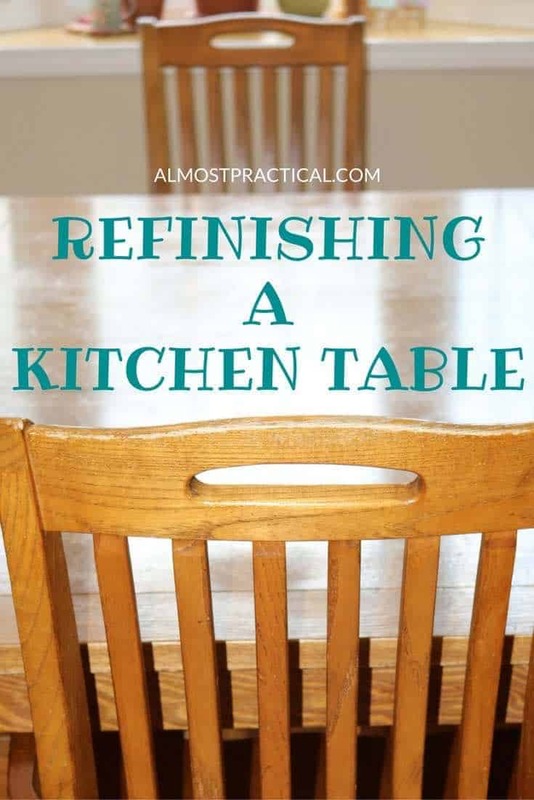 Do You Have Experience Refinishing a Kitchen Table? Please share your words of wisdom in the comments below. Your ideas will be very helpful.